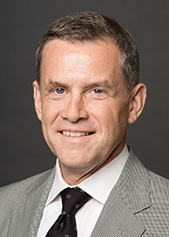 Patrick Quinn is Managing Partner of Cadwalader, responsible for both driving the strategic growth and direction of the firm as well as managing operations globally. Working with senior management, Pat oversees the development of Cadwalader’s client relationships and capabilities in key markets, and the firm's continued commitment to the highest levels of client service and attorney excellence. A 30-year veteran of Cadwalader, Pat has been integrally involved in the evolution of the firm into its position today as a trusted advisor helping clients solve the complex legal and business challenges posed by today’s global marketplace. Cadwalader also has a longstanding dedication to serving the public interest, and Pat is responsible for ensuring the firm’s robust pro bono efforts. Pat joined the firm in 1988, has been on the Management Committee since 2006 and is a member of the Hiring Committee. He was named Managing Partner in January 2015. Additionally, Pat is focused on fostering the development of the firm’s future leaders through professional development and recruitment. He is dedicated to Cadwalader’s diversity efforts, serving as chair of the Global Diversity Committee and as an active participant in the firm’s various affinity groups and inclusion initiatives. Diversity Journal recently recognized Pat and Cadwalader among its 2019 Diversity Leader Award winners. Pat is a respected corporate and securities lawyer who has practiced primarily in the area of mortgage and asset securitization and finance, representing issuers, underwriters, and investors in both public and private securities and financing transactions. He has broad experience in structuring and restructuring public and private residential and commercial mortgage securitization transactions. His clients include lenders in acquiring, financing and restructuring real estate B notes, mezzanine loans and preferred equity positions. He also has advised clients in the acquisition, disposition and financing of structured real estate debt instruments. Pat has been recognized in The Best Lawyers in America, Chambers USA: America's Leading Lawyers, Legal 500, IFLR 1000 and New York Super Lawyers, and was recently named by Lawdragon as one of the “500 Leading Lawyers in America” for 2019. He is a graduate of the University of Virginia School of Law and received his B.A. from Fordham University. Securitization Reforms: What is the Current State of Play? What are Covered Bonds and Why Should Anyone Care? "Constance Baker Motley, James Meredith and the University of Mississippi"